Psych0matt's 1992 Pontiac Grand Prix Mods list: page 23-28-13Washed her up and let her stretch her legs a bit today. Quick wash and some minor detailing just to clean up some of the grime from sitting all winter. Last week I wrapped the dashboard in charcoal suede, as well as the lower dash (under the steering wheel) and glovebox. The dash was in perfect shape until removing it, I cracked it not knowing it wasn't lined up right and tried to pop it in anyways. Got my steering wheel buttons working on my HU, and otherwise just did some checking over things, and again driving around for about an hour just because I could. 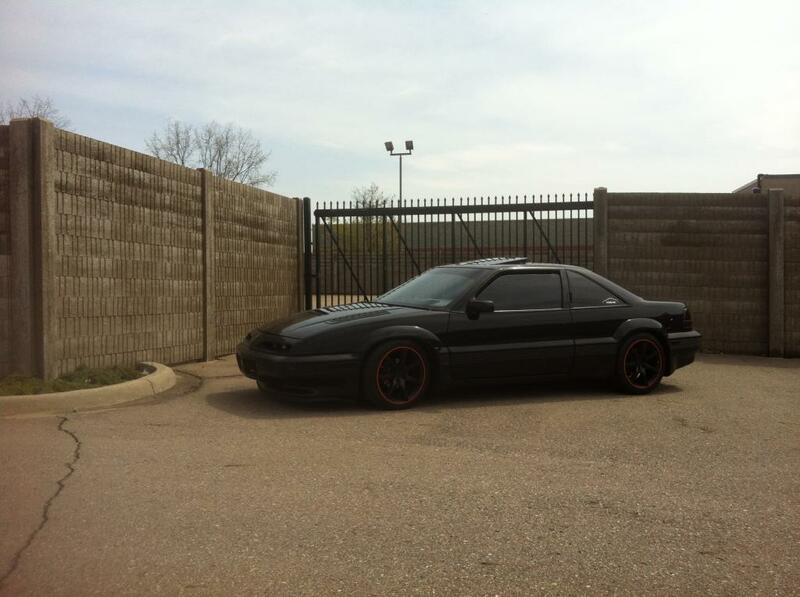 More updates soon, hopefully with a new exhaust setup.3-19-13Lots of new stuff on the way for spring! New exhaust waiting to be put on, WOT-Tech chip is ready to be installed, maybe some LED accents, an interior mod or two, maybe a few stickers, and hopefully a 96 intake swap and timing mods. No new pics yet, since she's still in hibernation. This stupid winter neds to finaly end so I can get cracking!6-6-12Wheels and brakes finished, all 4 corners were aligned and now nice and straight. Put on a new steering wheel, got all the windows tinted. All my summer projects are pretty much finished. Time to enjoy her for a while! 2-7-12Nice day, snapped a few quick pics. The rear calipers havent been painted yet, nor have the rotor hats, and the other three wheel center caps still need paint. 1-28-12Got some tires mounted, 245/40R18 Continental Contipros. They were used (and not my first choice), but for $200 mounted and balanced, I can't complain. I had to repaint the front calipers because the orange didn't match the pinstripe, but it does now. I just have to paint the rear calipers and brackets and that'll all be done. I repainted the hood louvres as well, but I'm not happy with them, so they'll get redone. I think it was just too cold, the paint didn't wanna settle. I have new mufflers to go on and I'm thinking about a new downpipe/cat since I can get a decent one pretty cheap, and hopefully eliminate what I think is a small exhaust leak. The windows will get tinted when it gets warm also. 2-17-11Been in the garage all winter, but I got the alternator all fixed and put back together, new stereo, FFP dogbone and K&N air filter, ordered $800 worth of suspension upgrades last night. Once spring comes, she'll be lower, and handle like shes on rails. Stay tuned, gonna run out and wash her up, maybe snap some new pics!